I began this series on scripting awhile back to teach all aspiring hackers how to write some basic scripts for hacking and reconnaissance. Without developing some basic scripting skills, the aspiring hacker will be condemned to the realm of the script kiddie. This means that you will be limited to using tools developed by someone else, which decreases your probability of success and increases your probability of detection by antivirus (AV) software, intrusion detection systems (IDS), and law enforcement. With some scripting skills, you can elevate to the upper echelon of professional hackers! In my previous scripting tutorials, I've covered BASH, Perl and PowerShell scripting, and along the way, we built our own network port scanner using Perl. Here we will begin looking at the most widely used scripting language for hackers, Python. Python has some important features that make it particularly useful for hacking, but probably most importantly, it has some pre-built libraries that provide some powerful functionality. Python ships with over 1,000 modules and many more are available in various other repositories. This isn't to say that scripting languages like BASH, Perl, and Ruby can't do the same things as Python, but building those capabilities are much easier using Python. If we need to install a third-party module, we can simply use wget to download it from the repository, uncompress the module, then run the python setup.py install command. 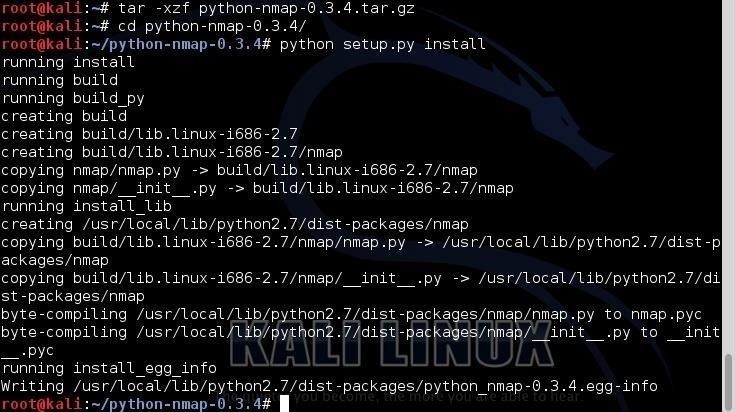 As an example, let's download and install the Nmap python module from a small repository at xael.org. Like the other scripting languages we have explored, we can create our script in any text editor. I'll be using the built-in GUI text editor in Kali, Leafpad, but you can use whichever text editor you prefer. To become familiar with the basics of running Python files, let's create a simple script in Leafpad and save it as greetings.py. print "Greetings to " + name + " from Null Byte!" The first line simply tells our system that we want to use the Python interpreter. The second line defines a variable "name" and assigns a value to it, in this case "your name." Note that I put in my name, "OTW." The third line then creates a print statement concatenating "Greetings to" with the value in the name variable to "from Null Byte!" Like any programming and scripting language, Python has the capability of adding comments. Comments are simply words, sentences, and even paragraphs that explain what the code is meant to do. Although comments are not required, it sure is helpful when you come back to it two years later and can't remember what that script was meant to do. Comments are not seen by the interpreter. This mean that any line designated a comment is skipped by the interpreter until it comes to a legitimate line of code. As with many other languages, Python uses the # at the start of a line to designate that single line as a comment. If we want to write multi-line comments, we can use three double quotation marks ("""). Python allows us to group our code into modules. If we want to use a module, we need to "import" it. When we import a module, we then gain access to all of the classes, class methods, and functions (don't worry if you don't understand this. I'll try to explain it in my next tutorial on Python) that were created in the module. These modules are one of the key features that makes Python so powerful for the hacker. These are the very basics of the Python scripting language. In our second guide on Python scripting, we will add variables, lists, arguments, dictionaries, control statements, functions, and exception handling working towards developing some simple, but valuable hacking scripts, so keep coming back, my greenhorn hacker! I can't wait for this (as for the many series you are coming up lately), python explained by OTW sounds quite interesting, I'm sure it will wipe all the shadows on my knowledge about python. I'm currently working with C (network programming) but I heard python is more reliable on this (is it?). GL with the script Cracker! "Without developing some basic scripting skills, the aspiring hacker will be condemned to the realm of the script kiddie" <-- so true. Also its worth mentioning sites like "code cademy". A great place to get started on coding, or do it the old fashion way, grab a book and follow along. (I personally like interactive sites more). Great topic, really looking forward to the sequels. because I think you need practise to learn scripting. So it's a great combination with OTW's tutorials. I love that quote, so much condensed truth in there. There is a free and really well done manual (for beginners in Python and programming in general) called "Learn Python The Hard Way". It encourages you to find some answers in documentation and search the web sometimes, if that's what you call "interactive". Trying to download the module from xael.org. Connecting to xael.org (xael.org)|194.36.166.10|:80... connected. 2017-08-10 03:21:34 ERROR 404: Not Found. If you click on the link, you get a 404 error, that means that it doesn't exist anymore. Use the link mentioned above.